There are dozens of species of hibiscus trees and shrubs, which share a common trait of large, colorful flowers. 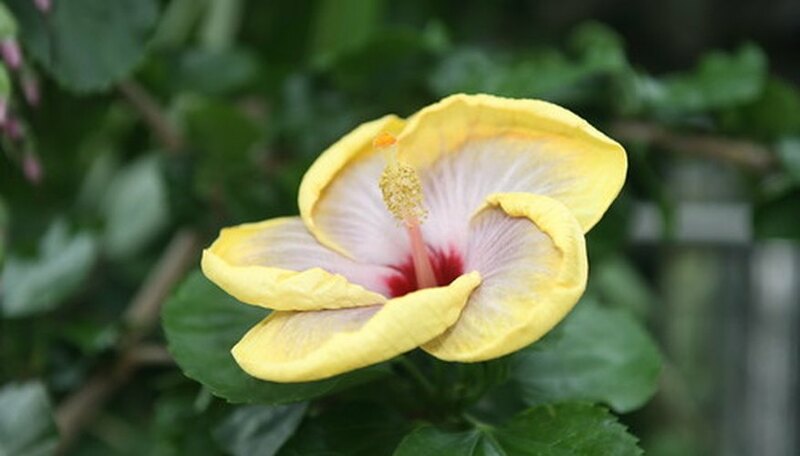 Some of the more well-known hibiscus trees can be distinguished by their height, leaves and flower color. Growing in the wild to heights of up to 30 feet, this tropical hibiscus isn’t likely to reach more than 15 feet in the garden. Its flowers, the state flower of Hawaii, are yellow with a maroon center and grow 4 to 6 inches wide. Known as St. John's rosemallow, this tree reaches heights of 10 to 20 feet and has oblong leaves covered with stiff, branched hairs. Its flowers have orange or yellow petals. This tree’s white, pinwheel-shaped flowers give it the common name of Hawaiian white hibiscus. It grows to heights of 15 to 20 feet and produces smooth, oval-shaped leaves. Hibiscus syriacus, or Rose of Sharon, is a hardy hibiscus tree or shrub that grows to approximately 8 feet in height with 3-inch-long, three-lobed leaves. The Ohio State University Department of Horticulture and Crop Science describes its 4-inch-wide, single- or double-flowering blossoms as “very showy,” and says they can come in the colors of white, red, purple, mauve, violet or blue, depending on the cultivar. The large, red flowers of this shrub or tree have earned it the common name of red hibiscus. It grows to heights of 15 feet.